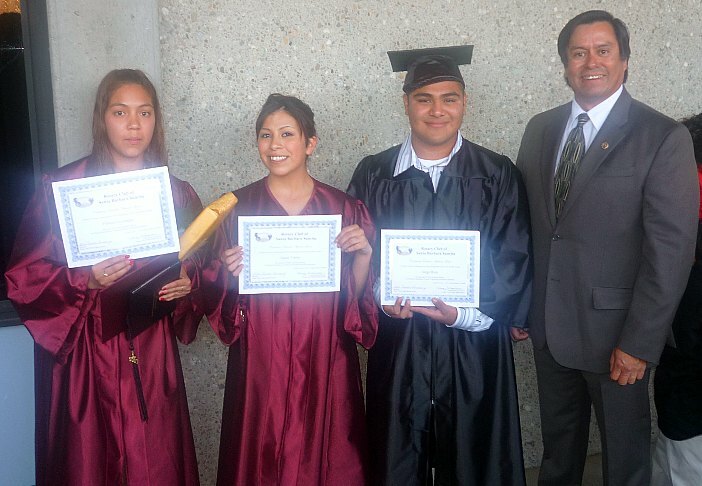 Bill Cirone, County Superintendent of Schools, presented 18 students with diplomas at the El Puente Community High School Graduation ceremony held this week. Rotary Club of Santa Barbara Sunrise member David Velarde, presented three of the students: Jorge Rios, Juana Torres and Hitxza Uriostegui with $500.00 Education Assistance Grants. Two of the students, Juana and Hitxza had been recipients of the Sunrise Student of the Month award. Jorge Rios is currently enrolled at Santa Barbara City College. He wants to study photography and film and hopes to be a film director someday. Juana Torres will be attending Santa Barbara City College in the fall and plans to study journalism and photography. Hitxza Uriostegui will be moving to Las Vegas and plans to pursue a nursing career.